2011 Emmy Awards: Are We Happy? Another Emmy Awards show is in the bag, and as always the results have drawn praise and condemnation in equal measure. Well you can't please everyone all the time. Then again, unless you're a big fan of Modern Family, there wasn't much to be pleased about – at least not in the comedy section of the winners list. A couple of the Emmy voters choices in the field of drama did help to smooth things over however. The category for supporting actors in a comedy series was actually doomed long before Jane Lynch came out on stage. From the fall of 2010, to the spring of this year we were treated to an incredibly strong season of comedic television(especially in the spring). Making those months fly by with laughter were a slew of gifted actors, nearly none of whom made it into the nominations. For my money, the greatest injustice is Park and Recreation's Nick Offerman going without recognition for what has quickly become one of television's most iconic characters. Of course, when two-thirds of the category is reserved for the entire adult-male cast of Modern Family, it's hard to find room for Ron Swanson – let alone that mustache. Unfortunately, the amount of undeserved praise for ABC's massively hit sitcom didn't end with the acting categories. As someone who loved Modern Family's first season, it is doubly painful to see the show garner so much acclaim after losing so much of its charm. The exact same setups, with punchlines that are half as funny, do not a good sophomore season make. But clearly the voters disagree, as they added another five Emmys to Modern Family's mantelpiece. With them went the hope of seeing a show like Louie at least pick up the award for best writing. Which wouldn't have been so bad if the big prize had gone to the right show. Parks and Recreation is without a doubt the only series I would want winning best comedy, but even Steve Carrell's final season of The Office would have been preferable. There was at least some good news to be had though, and it proved the Emmys could still get a few things right. The scifi/fantasy genre doesn't have a good track record with the Emmys, or awards shows in general, so it was nice to see it have any representation in the major categories. It also doesn't hurt that Peter Dinklage gave the best performance out of the cast of Game of Thrones(don't chop my head off for that Sean Bean fans). 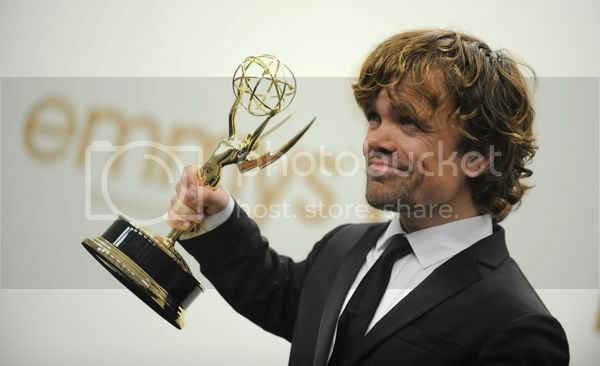 Whether you care for his accent as the Imp or not, Dinklage is still an incredibly talented actor, who was deserving of recognition for his contribution to the HBO series. And so for his role as Tyrion Lannister he was awarded with the title of best supporting actor; besting four-time nominee, John Slattery, who has yet to take home the prize after four nominations for his years on Mad Men. Slattery still had reason to celebrate at the after party though, as AMC's critically acclaimed period piece won television's highest honor for the fourth year in a row. While some may be getting tired of seeing the same show win time after time, Mad Men has consistently been the source of television's finest drama. The fourth season was no exception; in fact, if any season should have won, the fourth was it. With Bryan Cranston not in the running, many -myself included- thought it would be Jon Hamm's year as well. But just as was the case with his onscreen drinking buddy; the fourth time was no more a charm than the third. Having never seen Friday Night Lights, I won't argue that Kyle Chandler didn't earn the Emmy, but it's hard to imagine anything could top Hamm's performance in “The Suitcase.” And while FNL also claimed the Emmy for writing, neither instance is enough to spoil the joy from Mad Men's well-earned four-peat. Not being one for the pomp and circumstance that comes along with awards shows, the event itself rarely draws my interest. However, there was one small segment of FOX's presentation that was entertaining enough to deserve a spot closing out this article. Breaking Bad may not have been in the running this year, but one of the show's stars did give a great, albeit brief, performance. Part of a longer running bit centered around The Office, Aaron Paul's sudden appearance was definitely the scene stealer. Looks like Gus Fring's territory has expanded to include Scranton. So what shows and actors did you feel were snubbed? And which earned their awards?